Don't wait to let Mom know how special she is! 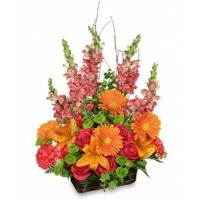 We have many fresh and beautiful arrangements that any mother is guaranteed to love. 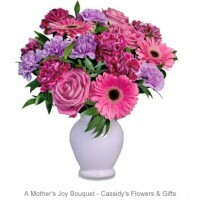 There’s no better way to show Mom that you care than with a beautiful, colorful bouquet for her home or office. Create an even more special treat by adding a box of chocolates, or send a live plant for a Mother’s Day that will last all year! Sometines all she needs is a little "pink-me-up!" An ideal pick for anyone whose favourite colour is pink. This stylish mix is full of and comes presented in a clear glass bubble bowl she'll use again and again. Style of vase may vary. To ensure the best arrangement, flower varieties and accen.. 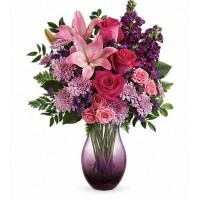 This beautiful bouquet features a mix of pink roses and lavender flowers ... a perfect way to let Mom knowthat you can't think of a better way to express your love to the woman who inspires you every day! Style of vase may vary. To ensure the best arrangement, flower varieties and ..
Make this day unforgettable! This dramatic bouquet will make it an unforgettable day she'll treasure forever. Style of vase may vary. To ensure the best arrangement, flower varieties and accents may vary. Substitutions may be necessary due to seasonal availability of some flowers. ..
A romantic gift like this one is always appreciated. An eye-catching display of roses and lilies is perfectly arranged in a feminine vase which makes a beautiful and lasting impression. 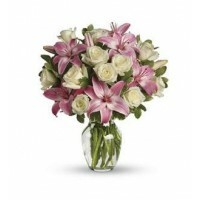 Elegant white roses and sweet pink asiatic lilies are hand-arranged with greens. It is the perfect way to show you..
Just one look at this truly original arrangement will leave her smiling bigger and brighter. Filled with pink carnations, hot pink roses and light pink roses ... we think it is an ideal gift for Mother's Day, Anniversaries, Birthdays or any other day that you want to put someone special in the spotl.. This bouquet is feminine and full of colour. 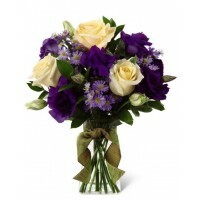 A sophisticated combination of multi-toned pink flowers are contrasted with lavender roses. It is the perfect gift for someone who deserves all the frills. Substitutions may be necessary due to seasonal availability of some flowers. .. 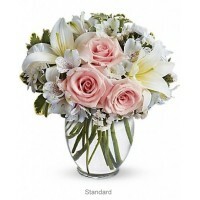 This classic glass vase contains light pink roses, white asiatic lilies, alstroemeria and chrysanthemums. Soft-hued and heartwarming. This beautiful bouquet will certainly arrive in style. Ready for the runway or simply showing you care. This delightful combination of flowers is simply beau!tiful ..
A-tisket, a-tasket, a happy yellow basket! A cheerful gift basket for birthdays or anytime you want to send sunshine. It nearly overflows with big lilies, gerberas and roses. A pretty butterfly floats over this basket, reminiscent of a summer picnic. Style of basket may vary. ..
What else could we call this creation of roses, Stargazers and snapdragons but beautiful flowers? 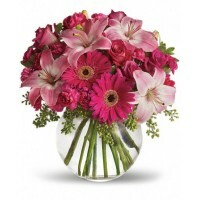 Send her this florist arranged vase of flowers in pink, red and white. A perfect gift for Mother's Day, where beauty, style and grace are called for. To ensure the best arrangement, flowe.. 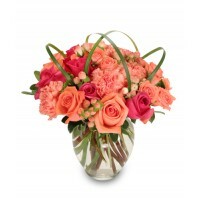 This bouquet is full of blushingly sweet colours and unique tiered design. Three delightful Pink Roses form the crown of this floral bouquet. 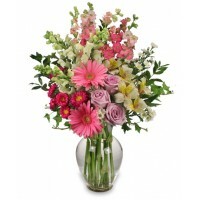 The middle tier is filled with beautiful Alstroemeria, followed by a layer of sweetly-scented Pink Carnations. 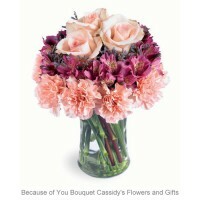 This bouquet will make an extraordinary gift fo..
Passionately pink! 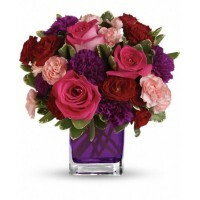 Hot pink roses and dark red spray roses are arranged in our vivaciously violet cube. Substitutions may be necessary due to seasonal availability of some flowers. ADD SOMETHING SPECIAL TO THIS GIFT (see Related Products tab above). .. It is her day. 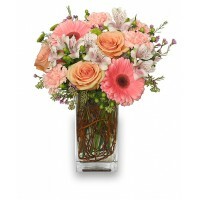 Make it one she will always remember with this gorgeous arrangement of peach roses, pink gerberas and white alstroemeria accented with bright green kermit mums, all artistically arranged in a modern glass vase she can use again and again. Style of vase may vary. 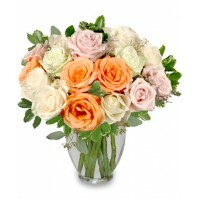 Substitutions ma..
Express yourself perfectly with this stunning bouquet of blush roses. These gorgeous roses are paired with a stylish vase making this an unforgettable gift. Note: Roses will arrive in bud form, ready to bloom. Style of vase may vary. Substitutions may be necessary due to seasonal availabili.. Send this brilliant arrangement to let your special someone and transform any celebration into the must-attend event of the season. Perfect for impressing friends and family or for simply dressing up any room in the home. Style of basket may vary. Substitutions may be necessary due to se..